A new bridge, the widest in the world, being constructed over the Bosphorus Strait, will provide another transportation route connecting Europe and Asia. Thousands of employees and engineers are working 24 hours a day on construction of the Yavuz Sultan Selim Bridge in Istanbul, Turkey. The suspension bridge is almost 60 meters (200 feet) wide with eight traffic lanes and two rail lines. 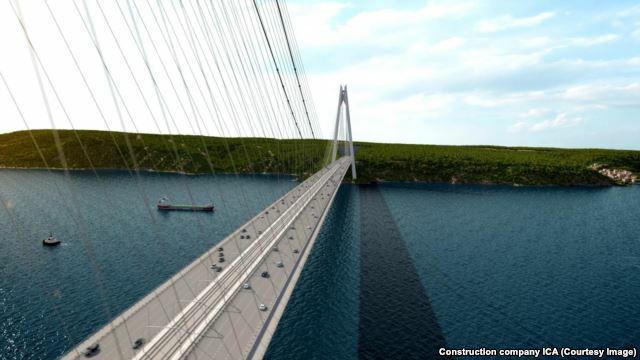 It will stretch over 2 kilometers with about 1.5 kilometers over water, and will be the longest suspension bridge in the world carrying a rail system. The project that started in 2013 is reported to have an estimated cost of $3 billion. Istanbul’s third Bosphorus bridge has a catwalk that was completed July 26, which will be used to extend the main cable between the two support towers. The height of the tower in Garipçe village on the European side is 322 meters and the other tower in Poyrazköy district on the Asian side is 318 meters high. It has also been reported that employees and engineers can now cross the bridge by foot.